tests green are ready to install. "gsa 14/01/2013 for Cuis port"
out := WriteStream on: ''. [converter nextPut: in next toStream: out].
" gsa 18/01/2013 used String instead ByteString for Cuis"
"chunk := ByteString new: 5." self loop: (swazooProcess _ [ [ self acceptConnection ] repeat ] newProcess). 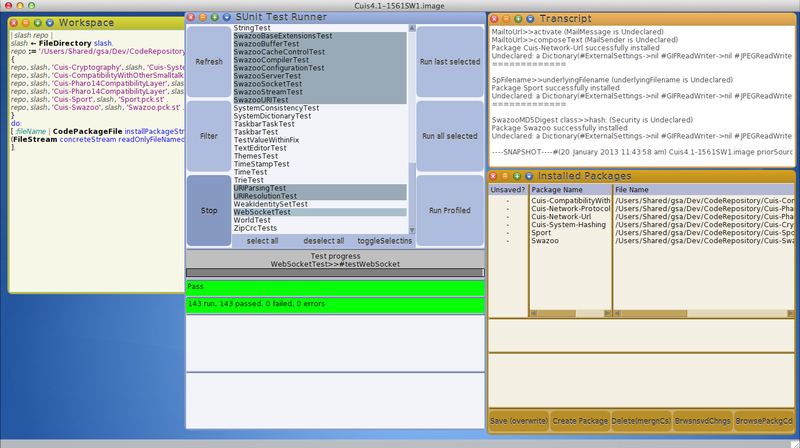 swazooProcess name: 'Swazoo ' , DateAndTime now asString. swazooProcess name: 'Swazoo HTTPServer Test'. stream _ SwazooStream socket: socket. [server ip: 'localhost'; port: 8123.
socket := SpSocket connectToServerOnHost: 'localhost' port: 8123. Security class don't exist neither in the pharo one click image. #trimSeparators, is named in SwazooMD5 but do not seems implemented. 1. Take a new Cuis 4.1 image. repo, slash, 'Cuis-Cryptography', slash, 'Cuis-System-Hashing.pck.st' . repo, slash, 'Cuis-Sport', slash, 'Sport.pck.st' . repo, slash, 'Cuis-Swazoo', slash, 'Swazoo.pck.st' . have still 1 failing test. leave the port in a stable state. Thank you for porting Sport and Swazoo. version in the Compabilitiy layer package. > tests green are ready to install. > "gsa 14/01/2013 for Cuis port"
> converter := UTF8TextConverter new. > in := aString readStream. > out := WriteStream on: ''. > [converter nextPut: in next toStream: out]. > " gsa 18/01/2013 used String instead ByteString for Cuis"
> "chunk := ByteString new: 5." > self socket listenFor: 128. > swazooProcess name: 'Swazoo ' , DateAndTime now asString. > swazooProcess priority: Processor userBackgroundPriority. > (Delay forMilliseconds: 100) wait. > server _ HTTPServer new. > server start ] newProcess. > swazooProcess name: 'Swazoo HTTPServer Test'. > stream _ SwazooStream socket: socket. > server := HTTPServer new. > [server ip: 'localhost'; port: 8123. > socket := SpSocket connectToServerOnHost: 'localhost' port: 8123. > Security class don't exist neither in the pharo one click image. > #trimSeparators, is named in SwazooMD5 but do not seems implemented. > 1. Take a new Cuis 4.1 image. > slash _ FileDirectory slash. > repo, slash, 'Cuis-Cryptography', slash, 'Cuis-System-Hashing.pck.st' . > repo, slash, 'Cuis-Sport', slash, 'Sport.pck.st' . > repo, slash, 'Cuis-Swazoo', slash, 'Swazoo.pck.st' . > have still 1 failing test. > leave the port in a stable state. example see below. That way it is easier to review the changes. somewhere so that we can download it? dialects as "least common denominator" too, I'll try to do that today on VW. > self loop: (swazooProcess _ [ [ self acceptConnection ] repeat ] newProcess). points too hard to achieve? an UI is not part of Cuis. > Latin 9 (ISO 8859-15)"
> version in the Compabilitiy layer package. >> tests green are ready to install. >> "gsa 14/01/2013 for Cuis port"
>> converter := UTF8TextConverter new. >> in := aString readStream. >> out := WriteStream on: ''. >> [converter nextPut: in next toStream: out]. >> " gsa 18/01/2013 used String instead ByteString for Cuis"
>> "chunk := ByteString new: 5." >> self socket listenFor: 128. >> swazooProcess name: 'Swazoo ' , DateAndTime now asString. >> swazooProcess priority: Processor userBackgroundPriority. >> (Delay forMilliseconds: 100) wait. >> server _ HTTPServer new. >> server start ] newProcess. >> swazooProcess name: 'Swazoo HTTPServer Test'. >> stream _ SwazooStream socket: socket. >> server := HTTPServer new. >> [server ip: 'localhost'; port: 8123. >> socket := SpSocket connectToServerOnHost: 'localhost' port: 8123. >> Security class don't exist neither in the pharo one click image. >> #trimSeparators, is named in SwazooMD5 but do not seems implemented. >> 1. Take a new Cuis 4.1 image. >> slash _ FileDirectory slash. >> repo, slash, 'Cuis-Cryptography', slash, 'Cuis-System-Hashing.pck.st' . >> repo, slash, 'Cuis-Sport', slash, 'Sport.pck.st' . >> repo, slash, 'Cuis-Swazoo', slash, 'Swazoo.pck.st' . >> have still 1 failing test. >> leave the port in a stable state. > somewhere so that we can download it? initial filein of Aida as you asked. May be I can publish all together when have all finished? Yes, or self flag: #adaptedForCuis as Hannes suggested? > dialects as "least common denominator" too, I'll try to do that today on VW. ok! And count me to maintain Sport / Swazoo in Cuis. >> somewhere so that we can download it? > initial filein of Aida as you asked. > May be I can publish all together when have all finished? > Yes, or self flag: #adaptedForCuis as Hannes suggested? with proven "* specific" comments instead. >> dialects as "least common denominator" too, I'll try to do that today on VW. > ok! And count me to maintain Sport / Swazoo in Cuis. >>> somewhere so that we can download it? >> initial filein of Aida as you asked. >> May be I can publish all together when have all finished? >> Yes, or self flag: #adaptedForCuis as Hannes suggested? > with proven "* specific" comments instead. >> ok! And count me to maintain Sport / Swazoo in Cuis. >>> Yes, or self flag: #adaptedForCuis as Hannes suggested? >> with proven "* specific" comments instead. > in Squeak and Cuis? find such error with dialect specific code browser easily. propose to continue for Cuis port as well. >>>> Yes, or self flag: #adaptedForCuis as Hannes suggested? >>> with proven "* specific" comments instead. >> in Squeak and Cuis? > find such error with dialect specific code browser easily. Sounds good, but is a bit abstract. > propose to continue for Cuis port as well. I assume you have a package which implements such a layer. Could you give a reference please? >>>>> Yes, or self flag: #adaptedForCuis as Hannes suggested? >>>> with proven "* specific" comments instead. >>> in Squeak and Cuis? >> find such error with dialect specific code browser easily. > Sounds good, but is a bit abstract. > Could you give an example, please? key := (aHTTPRequest headerAt:'Sec-WebSocket-Key' ifAbsent:) value. key = nil ifTrue: [^nil]. hash := self shaHashFrom: string. >> propose to continue for Cuis port as well. > I assume you have a package which implements such a layer. > Could you give a reference please? 'VW specific' in method comments"
first method to other dialects too. (SwazooSocket serverOnIP: self ipCorrected port: self port). not stored in any variable, so I propose to leave this method unchanged. does not have an entry for VW Swazoo alone. > (SwazooSocket serverOnIP: self ipCorrected port: self port). > [self loop: interactionBlock newProcess. > not stored in any variable, so I propose to leave this method unchanged. > #newProcess is safer in Squeak and Pharo too. development and deployment environment for commercial work. >> (SwazooSocket serverOnIP: self ipCorrected port: self port). >> [self loop: interactionBlock newProcess. >> not stored in any variable, so I propose to leave this method unchanged. >>> tests green are ready to install. >>> "gsa 14/01/2013 for Cuis port"
>>> converter := UTF8TextConverter new. >>> in := aString readStream. >>> out := WriteStream on: ''. >>> [converter nextPut: in next toStream: out]. >>> " gsa 18/01/2013 used String instead ByteString for Cuis"
>>> "chunk := ByteString new: 5." >>> self socket listenFor: 128. >>> swazooProcess name: 'Swazoo ' , DateAndTime now asString. >>> swazooProcess priority: Processor userBackgroundPriority. >>> (Delay forMilliseconds: 100) wait. >>> server _ HTTPServer new. >>> server start ] newProcess. >>> swazooProcess name: 'Swazoo HTTPServer Test'. >>> stream _ SwazooStream socket: socket. >>> server := HTTPServer new. >>> [server ip: 'localhost'; port: 8123. >>> socket := SpSocket connectToServerOnHost: 'localhost' port: 8123. >>> Security class don't exist neither in the pharo one click image. >>> #trimSeparators, is named in SwazooMD5 but do not seems implemented. >>> 1. Take a new Cuis 4.1 image. >>> slash _ FileDirectory slash. >>> repo, slash, 'Cuis-Cryptography', slash, 'Cuis-System-Hashing.pck.st' . >>> repo, slash, 'Cuis-Sport', slash, 'Sport.pck.st' . >>> repo, slash, 'Cuis-Swazoo', slash, 'Swazoo.pck.st' . >>> have still 1 failing test. >>> leave the port in a stable state. Ok! Fixed at this way, tested and commited! > to help I will integrate it when finish with Aida. >> charset it supports (ISO-8859-15, covering nearly all the latin alphabets). The file in gave the Transcript error messages copied in below. Is this the full number? running. "Doit" from a workspace:"
site := Site new name: 'test'. "name is just for convinience"
Thank you for your work on porting a web server to Cuis. >> to help I will integrate it when finish with Aida. > The file in gave the Transcript error messages copied in below. > Is this the full number? > running. "Doit" from a workspace:"
> site := Site new name: 'test'. "name is just for convinience"
> site host: 'localhost' ip: '127.0.0.1' port: 8888. > SwazooServer singleton addSite: site. Currently you should use SwazooSite instead Site. to Swazoo, what do you think? Sorry, but I do not have access to the swazoo site. Annotated on my to-do list. > Thank you for your work on porting a web server to Cuis. > does not have an entry for VW Swazoo alone.